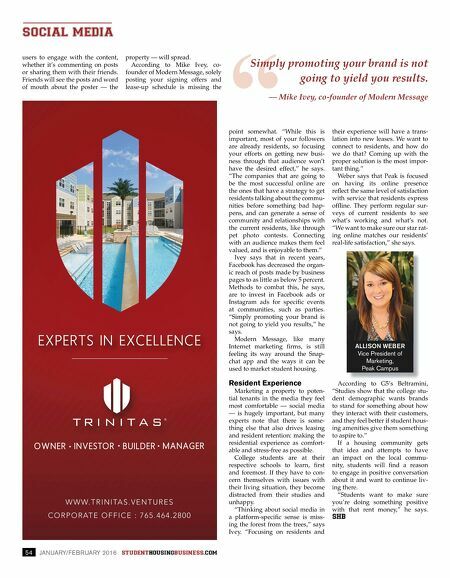 PACKAGE AND MAIL MANAGEMENT STUDENT HOUSING BUSINESS .COM JANUARY/FEBRUARY 2016 55 W With the increasing prevalence and convenience of online shopping, many consumers are choos- ing to buy more and more goods over the Internet versus in stores. While the effects of online shop- ping have certainly been felt by brick-and-mortar retailers, multifamily properties, including student housing, are also being impacted in a big way: a major increase in the number of delivered pack- ages to manage. Often overlooked or thought of as a burden of the job, owners and property managers have dealt with resident mail and package delivery behind the scenes for years. But with the infux of online ordering and free shipping, owners and operators are taking a second look at mail and package management. Some owners/operators, like REIT giant Camden Property Trust, have announced that they will no longer accept packages on behalf of tenants, while others have found in-house or third-party solutions to the ever-increasing volume of parcels and packages. The Problem "With free shipping and student-specifc offers like Amazon Student, online retailers are going after younger markets who see order- ing goods online as a normal part of life," says Melody Akhtari, director of marketing and communications with San Francisco-based Luxer One. "As a result, student housing com- munities have become overwhelmed with managing the fow of packages arriving for their residents." 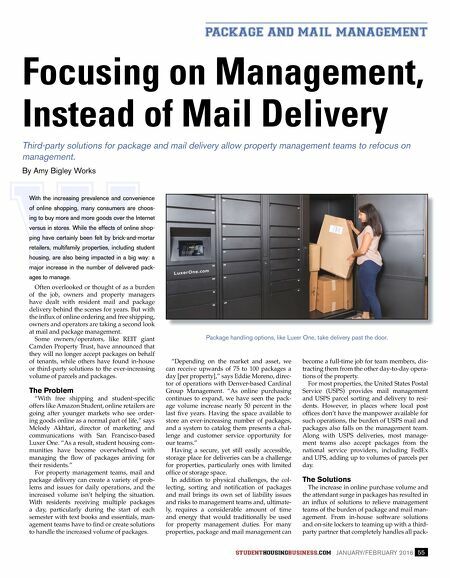 For property management teams, mail and package delivery can create a variety of prob- lems and issues for daily operations, and the increased volume isn't helping the situation. With residents receiving multiple packages a day, particularly during the start of each semester with text books and essentials, man- agement teams have to fnd or create solutions to handle the increased volume of packages. "Depending on the market and asset, we can receive upwards of 75 to 100 packages a day [per property]," says Eddie Moreno, direc- tor of operations with Denver-based Cardinal Group Management. "As online purchasing continues to expand, we have seen the pack- age volume increase nearly 50 percent in the last fve years. Having the space available to store an ever-increasing number of packages, and a system to catalog them presents a chal- lenge and customer service opportunity for our teams." Having a secure, yet still easily accessible, storage place for deliveries can be a challenge for properties, particularly ones with limited offce or storage space. In addition to physical challenges, the col- lecting, sorting and notifcation of packages and mail brings its own set of liability issues and risks to management teams and, ultimate- ly, requires a considerable amount of time and energy that would traditionally be used for property management duties. For many properties, package and mail management can become a full-time job for team members, dis- tracting them from the other day-to-day opera- tions of the property. For most properties, the United States Postal Service (USPS) provides mail management and USPS parcel sorting and delivery to resi- dents. However, in places where local post offces don't have the manpower available for such operations, the burden of USPS mail and packages also falls on the management team. Along with USPS deliveries, most manage- ment teams also accept packages from the national service providers, including FedEx and UPS, adding up to volumes of parcels per day. The Solutions The increase in online purchase volume and the attendant surge in packages has resulted in an infux of solutions to relieve management teams of the burden of package and mail man- agement. From in-house software solutions and on-site lockers to teaming up with a third- party partner that completely handles all pack- Focusing on Management, Instead of Mail Delivery Third-party solutions for package and mail delivery allow property management teams to refocus on management. By Amy Bigley Works Package handling options, like Luxer One, take delivery past the door.